Neil Warnock: "Nobody gave him a chance either, he has been written off that many times and we have." Cardiff's hopes of avoiding Premier League relegation also appear fanciful with a five-point gap to safety and their remaining five fixtures including games against Liverpool and Manchester United. But Cardiff would cut the gap to two points by winning at Brighton tomorrow night, although Chris Hughton's Seagulls do have a game in hand. "We just have to look at the golf and at what Tiger has done - amazing," Warnock said of Woods' fifth Augusta triumph, which came after multiple back surgeries and personal problems had threatened to end the 43-year-old's career. "We haven't got time to do that [at Brighton] and if it's not good enough then we accept it. Asked if Brighton was the point of no return after Saturday's 2-0 defeat at Burnley, Warnock replied: "Yes I think you can say that. "I thought we had to beat Burnley and and Brighton if I am honest, so we are already one down. "So it becomes even more important for both teams. I think they must feel the same. 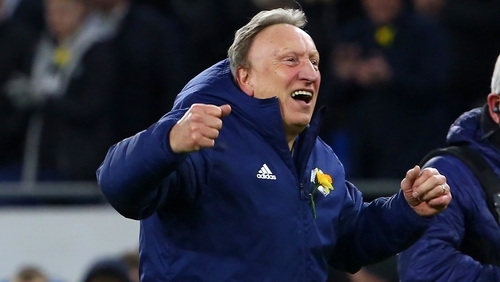 But Warnock, who confirmed he is to contest three Football Association charges over remarks he made about Premier League officials following the 2-1 home defeat to Chelsea last month, said: "We have to make our own luck. "We have for the last 18 months and I'm not expecting any luck. "When you look at the league table you're not going to be bubbly, but you have to be optimistic. "We have had that many kicks in the teeth in the last four months and we keep bouncing back really."